This article is about conservatism as a political and social philosophy. For other uses, see Conservatism (disambiguation). One-nation conservatism (also known as one-nationism, or Tory democracy) is a paternalistic form of British political conservatism advocating preservation of established institutions and traditional principles combined with political democracy, and a social and economic programme designed to benefit the common man. This political philosophy views society as organic and values paternalism and pragmatism. The describing phrase 'one-nation Tory' originated with Benjamin Disraeli (1804-81), who served as the chief Conservative spokesman and became Prime Minister in February 1868. He devised it to appeal to working-class men as a solution to worsening divisions in society through introducing factory and health acts, as well as greater protection for workers. Michael Lind defines one-nation conservatism as "a political philosophy that sees the purpose of the elite as reconciling the interests of all classes, labor as well as management, instead of identifying the good of society with the interests of the business class". One-nation conservatism reflects the belief that societies exist and develop organically, and that members within them have obligations towards each other. It particularly emphasises the paternalistic obligation of those who are privileged and wealthy to the poorer parts of society. The ideology featured heavily during Disraeli's two terms in government between 1868 and 1880, during which the British parliament legislated major social reforms. Towards the end of the 19th century, the UK Conservative Party moved away from paternalism in favour of free-market capitalism, but fears of extremism during the interwar period caused the revival of one-nation conservatism. The Conservative party continued to espouse the philosophy throughout the post-war consensus from 1945, influencing the decision to maintain Clement Attlee's Labour government's Keynesian intervention in the economy, forming a welfare state and the National Health Service. Later years saw the rise of the New Right, which attributed the country's social and economic troubles to one-nation conservatism. David Cameron, who led the Conservative Party from 2005 to 2016, named Disraeli as his favourite Conservative, and some commentators and MPs[which?] have suggested that Cameron's ideology contains an element of one-nationism. Other commentators have questioned the degree to which Cameron and his coalition embodied One-Nation Conservatism, instead locating them in the intellectual tradition of Thatcherism. In 2016 Cameron's successor, Theresa May, referred to herself as a one-nation conservative in her first speech as prime minister and outlined her focus on one-nation principles. 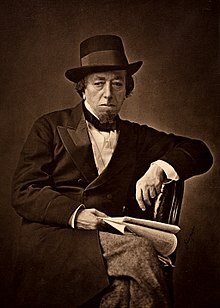 One-nation conservatism was conceived by the Conservative British Prime Minister Benjamin Disraeli, who presented his political philosophy in two novels – Sybil, or The Two Nations and Coningsby – published in 1845 and 1844 respectively. Disraeli's conservatism proposed a paternalistic society with the social classes intact but with the working class receiving support from the establishment. He emphasised the importance of social obligation rather than the individualism that pervaded his society. Disraeli warned that Britain would become divided into two "nations", of the rich and poor, as a result of increased industrialisation and inequality. Concerned at this division, he supported measures to improve the lives of the people to provide social support and protect the working classes. Disraeli justified his ideas by his belief in an organic society in which the different classes have natural obligations to one another. He saw society as naturally hierarchical and emphasised the obligation of those at the top to those below. This was based in the feudal concept of noblesse oblige, which asserted that the aristocracy had an obligation to be generous and honourable; to Disraeli, this implied that government should be paternalistic. Unlike the New Right, one-nation conservatism takes a pragmatic and non-ideological approach to politics and accepts the need for flexible policies; one-nation conservatives have often sought compromise with their ideological opponents for the sake of social stability. Disraeli justified his views pragmatically by arguing that, should the ruling class become indifferent to the suffering of the people, society would become unstable and social revolution would become a possibility. Benjamin Disraeli, the architect of one-nation conservatism. Benjamin Disraeli adopted one-nation conservatism for both ethical and electoral reasons. Before he became leader of the Conservative Party, Disraeli had announced that, as a result of the Reform Act 1867 which had enfranchised the male working-class, the party needed to pursue social reforms if it were to have electoral success. One-nationism would both improve the conditions of the poor and portray the Liberal Party as selfish individualists. Because the party portrayed itself as a national (and not class-based) party, its members were unsure whether to make specific appeals to the working-classes. A more positive approach to the working-class by the party developed later out of the electoral necessity to secure working-class votes. While in government, Disraeli presided over a series of social reforms which supported his one-nation politics and aimed to create a benevolent hierarchy. He appointed a Royal Commission to assess the state of law between employers and employees, the result of which prompted Richard Cross to pass the Employers and Workmen Act of 1875. This act made both sides of industry equal before the law and the breach of contract a civil offence, rather than criminal. Cross also passed the Conspiracy, and Protection of Property Act in the same year which enshrined the right to strike of workers by ensuring that acts carried out by a workers' group could not be indicted as conspiracy. By the end of the nineteenth century, the Conservatives had moved away from their one-nation ideology and were increasingly supportive of capitalism and free enterprise. During the interwar period, 1919–39, public fear of Communism restored the Conservative Party to one-nationism as it defined itself as the party of national unity and began to support moderate reform. As the effects of the Great Depression were felt in Britain, the party was drawn to even greater levels of state intervention. The Conservative Prime Ministers Neville Chamberlain and Stanley Baldwin pursued an interventionist style of conservatism which won them democratic support because of its wide electoral appeal. Throughout the post-war consensus of the 1950s and 1960s, the Conservative Party was dominated by one-nation conservatives whose ideas were inspired by Disraeli. The social and economic policies of the consensus appealed to the paternalism of one-nation conservatism because they appeared to provide prosperity and alleviate social problems such as poverty and disease; this was intellectually developed by the "new conservatism" movement, led by Rab Butler. New conservatism attempted to distinguish itself from the socialism of Anthony Crosland by concentrating welfare on those in need and encouraging people to help themselves, rather than foster dependency on the state. Until the mid-1970s, the Conservative Party was mostly controlled by one-nation conservatives. The rise of the New Right in conservative politics led to a critique of one-nation conservatism which contended that Keynesian economics and welfarism had damaged the economy and society. The Winter of Discontent of 1978–79 was portrayed by the New Right as illustrative of the overextension of the state. Figures such as Margaret Thatcher believed that to reverse the national decline, it was necessary to revive old values of individualism and challenge the dependency culture created by the welfare state. The Conservative Party's 2010 general election manifesto contained a section on "One World Conservatism" – a commitment to spend 0.7% of national income on well-targeted aid – and David Cameron, the Leader of the Conservative Party and UK Prime Minister until 2016, named Disraeli as his favourite Conservative. In 2006, Conservative Member of Parliament Andrew Tyrie published a pamphlet which claimed that Cameron was following the one-nationist path of Disraeli. Phillip Blond, a British political theorist who has had past connections with the Conservative Party, has proposed a renewed version of one-nation conservatism. I'm a one-nation Tory. There is a duty on the part of the rich to the poor and to the needy, but you are not going to help people express that duty and satisfy it if you punish them fiscally so viciously that they leave this city and this country. I want London to be a competitive, dynamic place to come to work. Other political uses of the term "one nation"
^ "Tory Democracy". Dictionary. Merriam-Webster. Retrieved 21 December 2017. ^ Blake 1966, pp. 487–89. ^ "FAQ: What is One Nation conservatism?". Politics for A level. 12 October 2009. ^ Lind, Michael (2013) . "The Center cannot hold: the defeat of one-nation conservatism in America". Up from Conservatism: Why the Right is Wrong for America. New York: Simon & Schuster. p. 45. ISBN 978-1-47676115-2. Retrieved 14 December 2018. […] what in Britain is called 'one-nation conservatism' – a political philosophy that sees the purpose of the political elite as reconciling the interests of all classes, labor as well as management, instead of identifying the good of society with the business class. ^ Daponte-Smith, Noah (2 June 2015). "Is David Cameron Really A One-Nation Conservative?". Forbes. Retrieved 29 February 2016. ^ McEnhill, Libby. "David Cameron and welfare: a change of rhetoric should not be mistaken for a change of ideology" (PDF). LSE Blogs. Retrieved 20 March 2015. ^ Griffiths, Simon. "Cameron's "Progressive Conservatism" is largely cosmetic and without substance". LSE Blogs. Retrieved 20 March 2015. ^ "Theresa May vows to be 'one nation' prime minister". BBC News. Retrieved 14 July 2016. ^ a b c d e Dorey 1995, pp. 16–17. ^ a b Heywood 2007, pp. 82–83. ^ Arnold 2004, p. 96. ^ Heywood 2007, pp. 82_83. ^ Bloor 2012, pp. 41–42. ^ Dorey 1995, p. 17. ^ a b Dorey 1995, p. 18. ^ a b Axford, Browning & Huggins 2002, p. 265. ^ Dorey 1995, pp. 18–19. ^ Adams 1998, p. 75. ^ a b Adams 1998, p. 77. ^ Dorey 2009, p. 169. ^ Adams 1998, p. 78. ^ Evans 2004, p. 43. ^ Heppell & Seawright 2012, p. 138. ^ "Invitation to Join the Government of Great Britain" (PDF). The Conservative Party. 2010. Retrieved 20 July 2012. ^ a b Blond, Phillip (28 February 2009). "Rise of the red Tories". Prospect. Retrieved 20 July 2012. ^ Wilson, Graeme (28 December 2006). "Cameron 'heir to Disraeli as a One Nation Tory'". The Telegraph. London. Retrieved 20 July 2012. ^ Harris, John (8 August 2009). "Phillip Blond: The man who wrote Cameron's mood music". The Guardian. London. Retrieved 10 August 2012. ^ Brogan, Benedict (29 April 2010), "Boris Johnson interview", The Telegraph, My advice to David Cameron: I have made savings, so can you . Adams, Ian (1998). Ideology and Politics in Britain Today. Manchester University Press. ISBN 978-0719050565. Arnold, Dana (2004). Cultural Identities and the Aesthetics of Britishness. Manchester University Press. ISBN 978-0719067693. Axford, Barrie; Browning, Gary; Huggins, Richard (2002). Politics: An Introduction. Routledge. ISBN 978-0415251815. Blake, Robert (1966). Disraeli. New York: St. Martin's Press. ISBN 0-19-832903-2. OCLC 8047. Bloor, Kevin (2012). The Definitive Guide to Political Ideologies. AuthorHouse. ISBN 978-1449067618. Dorey, Peter (1995). The Conservative Party and the Trade Unions. Psychology Press. ISBN 978-0415064873. Dorey, Peter (2009). British Conservatism and Trade Unionism, 1945–1964. Ashgate Publishing. ISBN 978-0754666592. Evans, Eric (2004). Thatcher and Thatcherism. Routledge. ISBN 978-0415270137. Heppell, Timothy; Seawright, David (2012). Cameron and the Conservatives: The Transition to Coalition Government. Palgrave Macmillan. ISBN 9780230314108. Heywood, Andrew (2007). Political Ideologies. Palgrave Macmillan. ISBN 978-0230521803. Lind, Michael (1997). Up from Conservatism. Simon and Schuster. ISBN 0-684-83186-4.